The 2019 USS Sterett Reunion will be here before you realize it. Hopefully, you’ve already made plans to attend. If you’re not there, your shipmates will be telling sea stories about you. 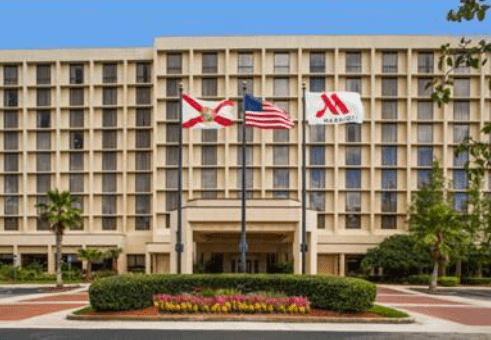 The room rate for the reunion will be $92 (+tax & fees). The room rate also includes a discounted breakfast buffet price of $12 per person, tax and gratuity not included. Room rate will be honored three days before and after the reunion. An Sterett Reunion specific online reservation link can be found here. ** Reservations must be received on or before August 29, 2019 to guarantee the discounted rate. Above served with vegetable of the day. Mixed greens, tomatoes, sliced cucumbers, shredded carrots with assorted dressings. We originally planned to visit the Budweiser Brewery. Unfortunately, Budweiser has discontinued tours to the Jacksonville location. Our search for a substitute location that fit our Saturday afternoon schedule was unsuccessful. Therefore, Saturday afternoon will be free time. 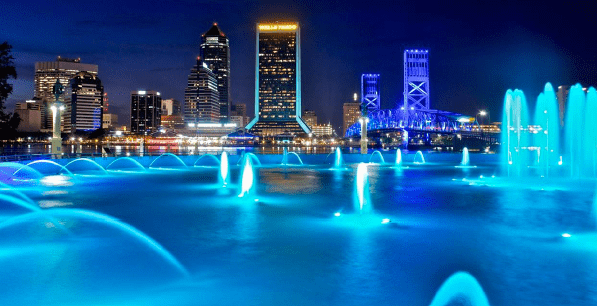 As the largest city in the continental U.S., Jacksonville is the perfect place to explore and discover something new, from its extensive park system (the largest in the nation with two national parks, seven state parks, and more than 400 city parks), to its beautiful relaxing beaches (22 miles of them), and its historic neighborhoods that are filled with character and charm. Checking out The Land of the Tiger at the Jacksonville Zoo and Gardens. Catching a show at the Bryan-Gooding Planetarium at MOSH. Drinking one of the Top 26 Cocktails in Jacksonville. Discovering our African-American heritage at Kingsley Plantation. Fishing, swimming, biking, and surfing at Hanna Park. Exploring the Gardens at the Cummer Museum of Art and Gardens. They are nearly 100 years old! Golfing at one of our area’s 70 courses. Paddle boarding or surfing in Jacksonville Beach. Running, biking or walking the RiverWalk from Downtown to Riverside. Sipping a beer at one of our local tap rooms and getting your Jax Ale Trail Passport stamped. Snapping a selfie at Friendship Fountain overlooking the Downtown Jacksonville Skyline. Spotting the murals in Downtown Jacksonville. Taking a kayaking tour of the Timucuan Preserve and its marshes. Riding on the Jacksonville River Taxi in Downtown. Visiting Atlantic Beach, it’s only 15 miles from Downtown and it’s as quaint a beach town as they get! Walking through the Currents of Times exhibit at MOSH. Watching a movie at Sun Ray Cinema in Five Points in Riverside. The registration process requires banquet entrée selection The registration form will expand with the entry of 2 or more guests. Online payment of fees will be through PayPal. You do not need a PayPal account to make the payment. Credit cards can be used using the PayPal interface. As soon as possible after arriving at the hotel, stop by the hospitality room to check in. Upon check in, you will be given name tags for you and your guests, a hat pin for your ball cap/lapel and a card indicating which dinner entrée you prefer at Saturday dinner (Behind your name tag). Be sure to bring the card with you to dinner and place it on the table. Kick back, have a beer or a soft drink and look around for that shipmate you’ve been anxious to catch up with. The hospitality room serves as a place to hang out when you’re not doing other things. A cash bar will be available in the hospitality room on Friday evening. Duffy Groener, our ship’s store custodian, will have Sterett “stuff” available for sale in the hospitality room. These items include ball caps, lighters, windbreakers, polo shirts, challenge coins, coffee mugs, window stickers and sew on patches. The Sterett reunion is a time to reunite with shipmates and friends. It is a time to reflect back on the people who helped to make us who we are today. It is a time to remember the good times we shared in days past. It is a time to laugh at the crazy things we did when we were young and reckless. It is not a time for airing our political differences, arguing about the state of the world today or taking up personal causes. Please keep it civil and light hearted. We will conduct our business meeting on Saturday morning. This meeting is restricted to members in good standing (dues current). You can bring your dues up to date here. The meeting will be conducted generally following Robert’s Rules of Order. The Sterett Association needs you to step up. If our organization is to remain strong, we have to have the active support of our younger shipmates. If you enjoy the reunions and other aspects of the Sterett Association, then get active. We need shipmates who served across the 27 years of Sterett’s service life to step up and take a position. Sterett Association officers are elected for a two year period. (Ships Storekeeper is a voluntary position) We will be looking for a volunteer to take over the store. The location for the 2021 Sterett reunion will be decided at the business meeting. Sterett shipmates live from one end of the Country to the other. The reunion location has been moved around the country to accommodate shipmates that live in various places. We’ve been to the Rockies (Littleton, CO), the mid Atlantic (Baltimore, MD), the southwest coast (San Diego, CA), the Gulf Coast (Biloxi, MS), the northeast (Portland/Bath, ME), the northwest (Silverdale/Tacoma, WA), sort of in the middle (Branson, MO) and now the southeast coast (Jacksonville FL). Perhaps it’s time to pay those who reside west of the Mississippi another visit. We would all like the next reunion to be in our own back yard but please give some thought to other shipmates who weren’t able to make the trip to Jacksonville. Jacksonville will be another great reunion location. Don’t miss the opportunity to mingle with your Sterett shipmates at the 2019 reunion.